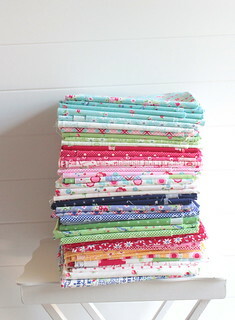 First things first, this post was brought to you by this finished Sunrise Studio table runner! I spent far too much time thinking about it and then actually doing it? It was a snap! Sometimes my brain doesn't do me any favors when it gets going. This runner takes a just takes some simple cutting and piecing. It was late enough in the day that I just snapped on quick picture of my pile of advance yardage. I love it so much, and want to take the time to take some nice photos to share, but right now like everyone else, I'm heavy on market prep. This is the first time in ages that I did any stunt sewing and I'm out of practice. WAY out of practice. I haven't even unfolded them yet.. pretty sad right? Well don't worry, soon enough. I just want to enjoy it and take my time, so I can wait. I hope you can too! They're so pretty. I think this is the prettiest Pam Kitty collection so far, and I'm so thankful for the opportunity to work with Holly. There's exciting things coming soon, I was emailing with Melissa yesterday and she said something about it being just about two weeks till market. HOLY COW. There is just two weeks! New Fabric - New Line - That is Exciting!! I often sit and gaze at it for awhile too before taking it apart - just to soak in the colors and designs. Congratulations! What a beautiful range of colors! Love it! Take your time savoring that stack of unfolded prettiness. Cute! such cuteness always! Can't wait until I can get some! Your runner would make an adorable long pillow sham on a twin bed with a PK quilt. It's all very exciting and motivating. Can't wait to play! Love the fabrics! I can see lots of pretty quilted handbags, totes, quilts, and pillows!! Lovely just lovely. Market mania must be in overload.